Downstream, the river raced swiftly out of sight and another huge rapid thundered a warning to our vulnerable rafts. Wisps of spray sparkled with the colors of the rainbow where the river disappeared and a menacing crocodile charged our rafts from the far bank. Sanctuary was a small eddy on the south bank of the river where hippos jumped on top of each other wary of the strange intruders. I shivered at the idea of running a rapid we had never seen, didn't fancy the idea of facing a crocodile longer than our raft and so opted to upset the hippos. A large bull rose out of the water, opened his huge mouth in warning and then crashed into the pool and disappeared. Seconds later, I pulled hard on the oars and spun the heavily laden raft into the eddy hoping he would not surface beneath me. We hit the bank, tied off the raft and watched the croc hold his ground behind a little rock island midstream. 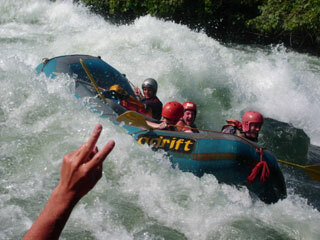 No-one had ever rafted these rapids before. More than four thousand miles in length, the mighty Nile is the longest river on earth. The great waterway has played a monumental role in history. It traverses an incredible variety of landscapes, a colorful medley of cultures and since the beginning of time has enthralled civilizations with its power and mystery. Ancient Egyptian kings sent armies in search of the source of the great river and explorers from Herodotus to Speke have sought to chart its course. Until very recently no one dared challenge the White Nile at its source - some of the most powerful and sustained rapids on earth. However, today Adrift have diversified into much 'softer' options to cater for the wide range of tourists the country now attracts. 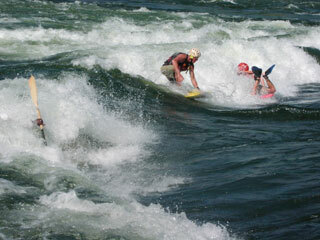 The company cater for rafters from ages 2-72 years and there is certainly no prerequisite regarding swimming. On average, several dozen non-swimmers raft the river every month and the wonderful thing about the Nile in Uganda is that it can meet the a variety of needs, desires and expectations. For those who want to challenge some of the biggest rapids on the planet then towering waves rise to meet the highest expectations. For 72-year old grandfathers who want to share the experience with their grandchildren then the Nile in Uganda offers a wonderful experience. There are no hippos and very few crocodiles in this section of river so swimming in the calm pools between the rapids is safe. Young children delight in leaping from the rafts to ride on safety kayaks who accompany every trip down the river, they marvel at the fish lying in the bottom of the dugout canoes the fishermen use and watch eagerly as troops of red-tailed monkeys fly through the trees alongside the river. 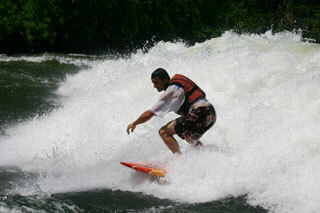 For the older children, the surf waves at Nile Special and Malalu provide huge excitement. Using boogie boards and fins the expert guides from Adrift instruct the children in the use of the foam boards to ride the waves. Incredibly these boards race down the face of waves and give the ride a thrill that brings a smile to both the kids and anyone who can see how much fun they are having. The waves behave much the same as an ocean wave and break every day of the year in much the same way. This is part of the reason the Nile is unique among rivers throughout the world. Lake Victoria and the dam at Owen Falls mean that the river level of the Nile remains relatively constant year-round so regardless of the time of the year, the Nile offers the ride of one's life. Perhaps most importantly, the Adrift presence in Uganda has created employment in an area where there was relatively little before. Over forty families from villages in the area are supported directly from a wage from the company. The volume of tourist traffic in the area has grown substantially and looks set to expand with the attraction of Uganda as a tourist destination. The Adrift presence in the area is attracting other investors and the goal of the company now is to increase the visitor nights to the area or increase the amount of time visitors spend in Kayunga District. In no small part this is only possible with the support and cooperation of the local community. Adrift recognizes that the future of tourism in Uganda and in Kayunga in particular is dependent on the the continued partnership between the company and the communities with which it comes into contact. 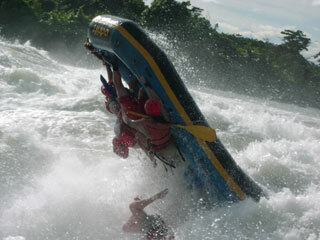 Neither Adrift or Uganda as a whole have to market Uganda as probably the most exciting destination in Africa. Those who come here marvel at the friendliness of the people, the beaming smiles and the warmth of the reception. Despite the reputation of the country and the tyranny of the past, today a visitor can expect one the warmest receptions they could find anywhere in the world. Couple this with a diverse range of exciting activities and a wonderful climate and you have a country that should be at the top of your 'to visit' list.